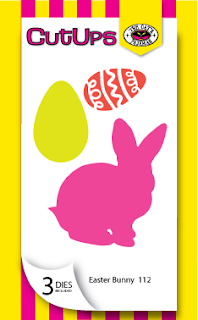 For my card, I used some patterned paper to offset the main panel and pop up the cut up of the bunny and Easter eggs. This set is called Easter Bunny. Once cut out, I sponged some Memento ink along the edges of the bunny and eggs for a little extra color. The sentiment is from the newly released set of Happy Easter. I finished the card with some sequins and some dots using my white gel pen. 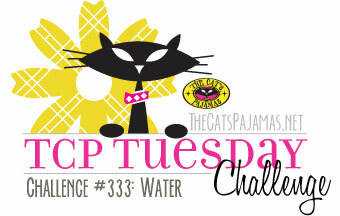 We sure hope you play along and link up your creation to the TCP Blog for your chance to win! Thanks so much for popping in and hope you have a great Tuesday! Are you ready for a new release for The Cat's Pajamas? That's right! A new release. We couldn't wait to get out some of these Spring/Easter beauties, we have just brought them out ready for you to purchase and create some beautiful projects! 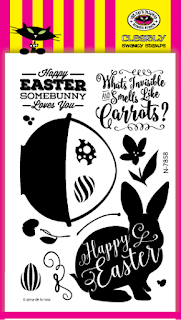 I am showing you today a card made using the Spring Wreath cut up and the sentiment from the new Happy Easter stamp set. I started with a patterned paper background and added some watercolor to the top panel for a pop of color against the wreath. The wreath is popped up and some white gel dots and pink gel pen were added for additional color. 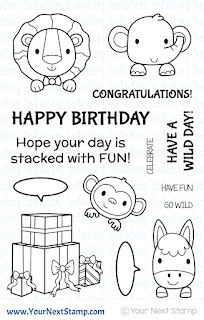 The sentiment was stamped directly onto the top panel to complete the card. Be sure to check out this fun release ready for your Spring project ideas! Thanks for stopping by and hope you have a great day! Who doesn't like a dose of laughter? Well, this month's Feature Day with Your Next Stamp is all about Laughter. 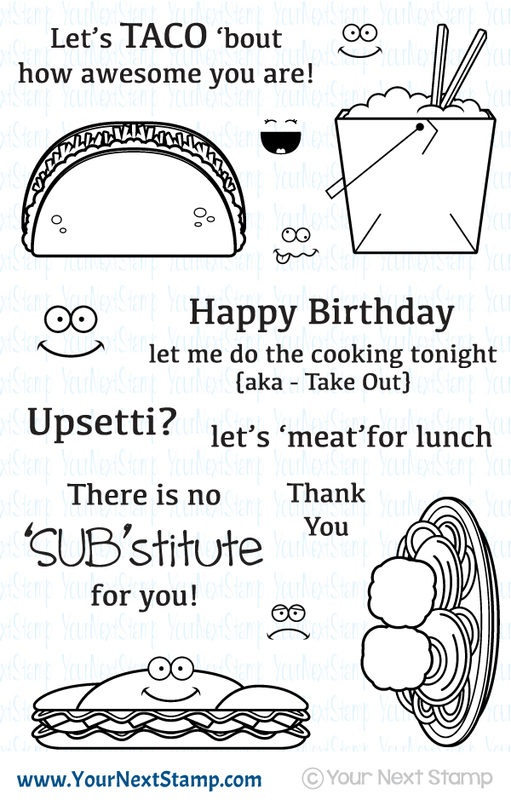 There are many stamps in the YNS Store that will tickle your funny bone and the DT has done a great job to show some of them off. 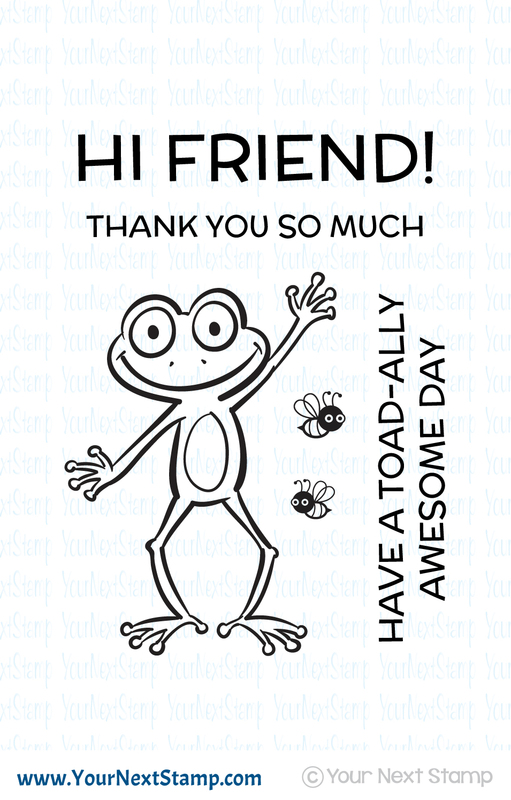 For my card, I am featuring the stamp set of 'Boom' for a chuckle that makes for a punny thank you card for someone. Using the YNS Grey Stone ink, I stamped off some color before stamping the background and then stamped, colored with Copics, and cut out using the coordinating die for the center image. 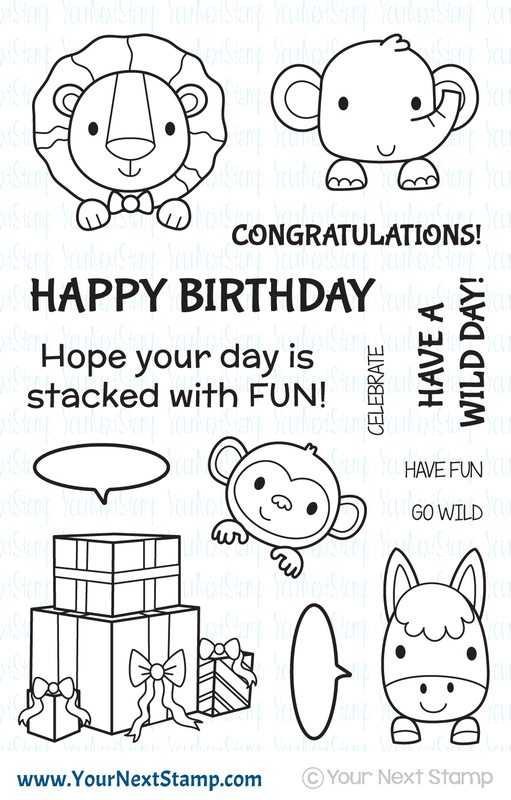 That image is popped up over the background with the sentiment stamped on some red cardstock at the bottom. 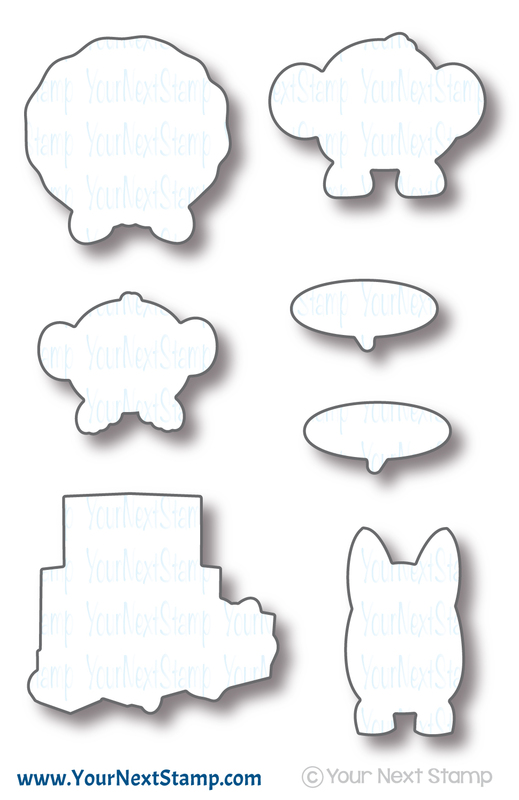 There are plenty funny projects showcasing some of the fun sets in the YNS Store over on the YNS Blog. Be sure to stop by and leave a little love for your chance to win a stamp set of your choice! We hope we were able to give you a little chuckle today and thanks so much for stopping by! Have a great Wednesday! Happy Friday and Happy St. Patricks Day! I am happy that the cold week is ending and finally some warmer temperatures in the future days. It is new sketch or color challenge over on the Your Next Stamp blog. We hope you share your creations and upload it to the linky so that you have a chance to win a gift certificate to the YNS store! For my creation, I am using a little bit of the new with a little bit of the old! 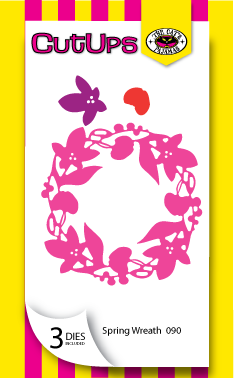 Using the new Funky Line panel die and the new Happy Spring paper collection, the background was put together. From the set of Smiley Happy Critters, I stamped the ladybug and colored it in with Copics. I finished the card by adding a few flowers stamped along the panels, the sentiment, and popped up a few of the little butterflies in the set. That about sums it up for me. Thanks for stopping by and hope you have a great weekend! Happy snow day for those of you on the East Coast who have gotten a bit of this Nor'easter Stella to drop some wintery weather! We are enjoying a day off here in our house with much snow outside. So for those of you with a day off and feel like getting a little crafty, why not play along with us over at The Cat's Pajamas and have a chance at winning a gift certificate to the store? This is the last week to play along in the current challenge of 'Water.' This can be anything to do with water - swimming, ocean, fishing, etc. For my card, I am using the set Aye Aye Captain and using just the lifesavers to create this thank you card. I started by using my perforated tool to run lines along the edge of my top panel. Then with some distress inks, I sponged over some blues and yellows lightly before adding the lifesavers over it. The lifesavers were stamped and colored with Copics and punched out with my circle punches. The sentiment was stamped directly onto the panel. Some patterned paper from Authentique was added to the back edge and finished with a strip of blue before adding the finishing touches of a few rhinestones. We hope you can play along and earn your chance to win! Be sure to upload your project on the TCP Blog and we look forward to seeing your what you create! 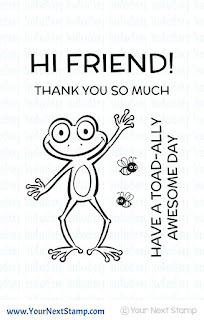 Thanks for stopping by and hope you have a great, warm day! It's the March Your Next Stamp DT dare! This month the design team is focusing on Spring colors. I don't know about you, but I am sure ready for the Spring weather to go along with the colors the season has to offer. For my card, I have created one using both the Mini Butterfly Splatter stamp and the Stacked with Fun stamp set and coordinating dies. For the base, I stamped the butterflies with Versamark and heat embossed them in white before sponging in some Distress Inks around it. I then stamped the image with the YNS Stone Grey ink before coloring it in with Copics. It was then cut out and popped up with some foam adhesive. The sentiment was stamped directly onto the base in the same Stone Grey color while the card was finished with some of the new Enchanted Garden Gumdrops. Be sure to stop by the YNS Blog to see all the fun creations the team has put together! Thanks for stopping in and hope you have a great Wednesday! 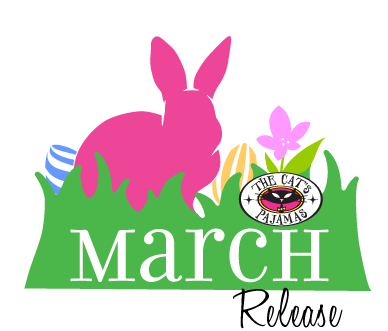 The March Your Next Stamp release is here! No more waiting to purchase your goodies on your list! This is such a fun release with some awesome dies to boot. I hope you were able to see some of the fantastic peeks the DT did to get your mojo rolling. 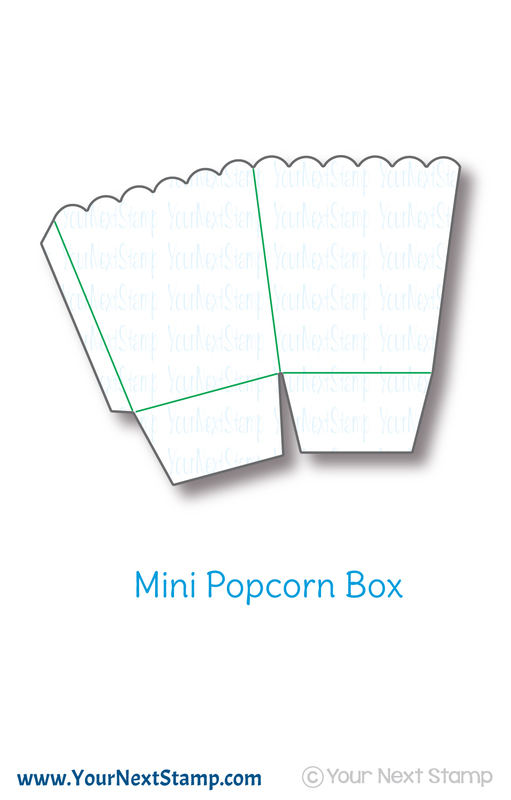 For my first project, I am using the new Mini Popcorn Box die to make this favor perfect for a wild birthday using the Stacked with Fun stamp set. 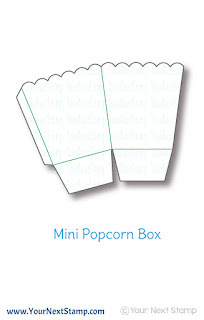 I cut out the Popcorn Box using some patterned paper from the retired Basic Grey Granola collection. The image was then colored in with Copics before using the coordinating die to cut him out. I glued him to the edge of the box so it looked as though he was hanging from it and cut out the sentiment to attach to the image in the bubble box. 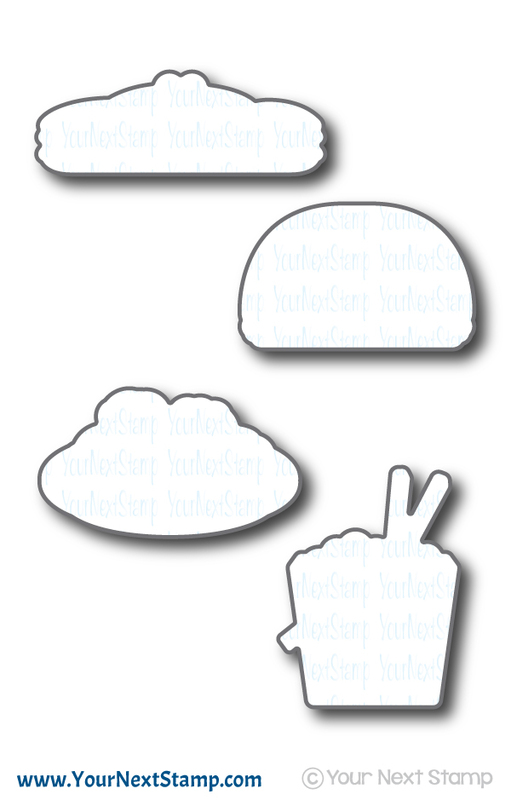 The main sentiment was stamped and cut out to be placed across the center. I felt like it needed some leaves, so I used some dies I had and added them to the banner. My second project is a card using the adorable Froggie Friend stamp set that coordinated nicely with some patterned paper from Doodlebug and Co. The image was colored in with Copics directly onto the panel overlaying the patterned paper. I stamped the sentiment at the top while adding some coordinating paper as a strip along the bottom. I completed the card bu going over the sentiment with a Karina Wink pen and added some of the new Enchanted Garden Gumdrops. 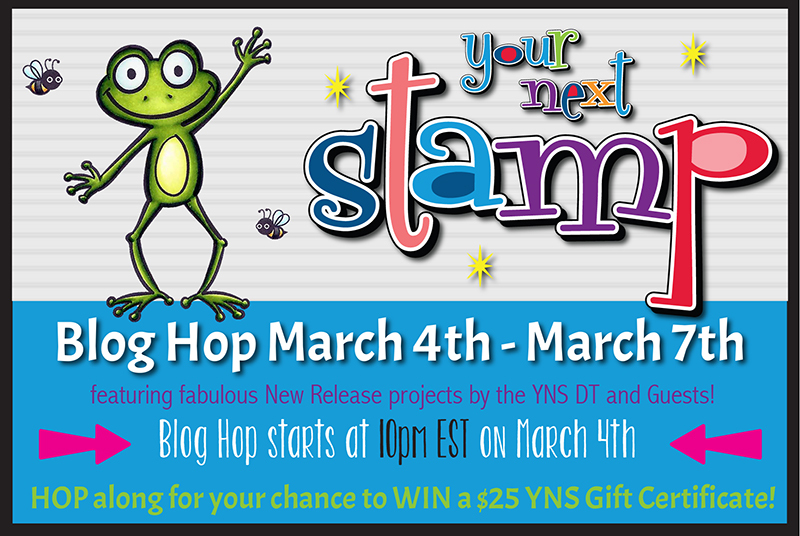 Remember that you can win a gift certificate to the YNS Store by leaving a little love as you hop along! For my sneak, I made two cards using the set Let's Do Takeout. 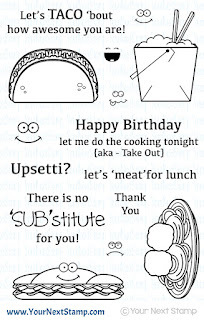 I can see a fun set of cards made from this set or at least many fun cards to give for a sure giggle. 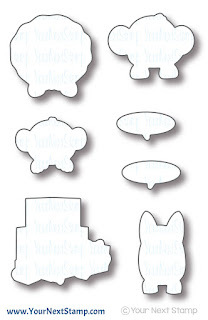 The images were colored with Copics and cut out using the coordinating dies. I kept both cards CAS as I felt the images and sentiment needed to stand out the most. 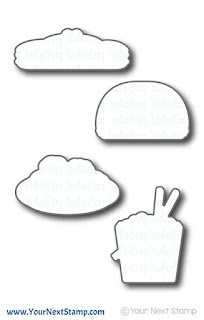 The sentiments were stamped directly onto the base and the images were popped up. A bit of patterned paper from MME was used on both to pop some of the colors. 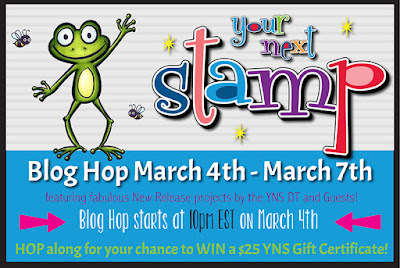 Pop into the YNS Blog to see all the fun creations the team has done with this release and get your list ready. 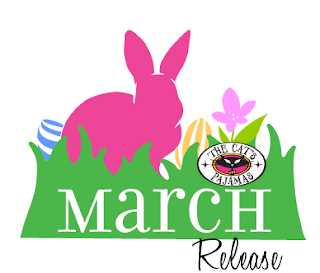 All items go on sale beginning at 10 PM EST and you will have a chance to hop along in the new release blog hop where you can win prizes just for leaving a little love! Get your reminders ready! Thanks for stopping by and hope you all had a great Friday!